I have been learning the German language on and off since I was seven years old. We had lessons in primary school, I took German in high school, I even continued German during my first year at university. When I lived in Bratislava I took lessons from a German teacher there (Hallo, Elisabeth!) and when I worked in Germany, the school I worked for provided lessons for me as part of my contract (Hallo, Susanne and Heike!). I speak German every day with my husband, and when I see my friends from our German playgroup. Yet still, after all this learning and practice, I still find some parts of German so difficult. And my husband could tell you a similar story about learning English. And that is the biggest reason why I want to bring our son up bilingually. It is SO much easier for a young child to acquire a second language than to have to learn it later in life. However, this logic is not a reasonable reason when you’re talking to a four-year-old who finds it (naturally enough) much easier to express himself in English and will only speak German when he really, really has to. I’ve had to develop a few tricks over the years to try and keep up his German. Some days I’m doing OK with it; some days we’re not, but I guess I can only do my best. 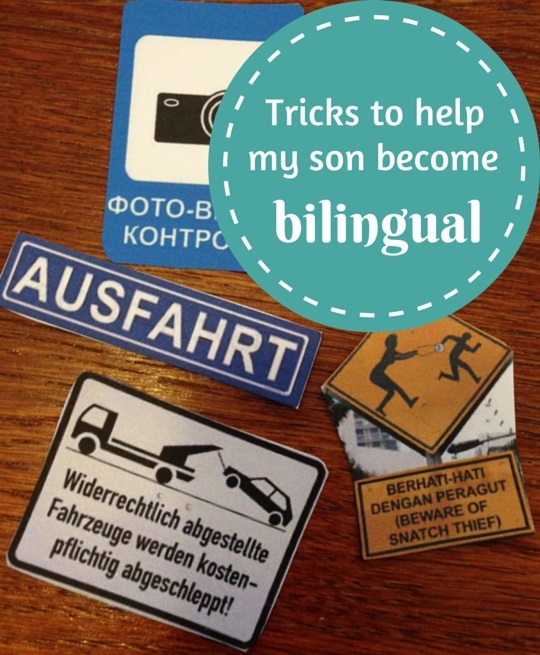 I hope these tricks might help some other parents in their bilingual journey. My son is big on roleplaying and one of his favourite things is to ask me to pretend to be his various toys. By good luck rather than good design, several of his favourite soft toys were gifts from his German family or are toys we bought in Germany. So I hit on the idea that these toys must only be able to speak German. Genius, right? My son’s not stupid but he’s willing to play along and he actually will speak German back to “Opa’s teddy” and “Erik the Elch” when they speak in German to him. What’s more, if I get Erik to speak English my son will interrupt me and tell me he only speaks German. For various reasons there are always a few words or phrases that our whole household defaults to German with – sometimes they might be words that were easier in German than English (fairly rare) or otherwise it can be totally random! For example, we always refer to the “bulk rubbish collection” as “Sperrmüll” because, obviously, it’s a lot shorter. That means that as a sneaky mother I can sometimes sneak a few German words into everyday life and play, because that’s just what we do. (Experts would say that mixing the languages like this is not ideal – but when you have a reluctant second language speaker I think every extra word or phrase is a win.) So when my son wanted me to find (more!) road signs for his games then I thought I’d add a few different languages but especially some German ones and of course “Ausfahrt” (exit) was a big hit! Like all small children, my son would like to watch more television than I want him to. (Such an addictive medium!). So we have come to a compromise on days when he is really asking for too much, but perhaps we don’t have too many alternatives (rainy days, for example, or if I’m unwell or have a big work deadline). I’ve got a bunch of DVDs of children’s shows in German and the deal is that if he wants to watch more TV, it needs to be from the DVD collection. I have worried at times that it’ll make him think negatively of the German DVDs but so far, it seems to work fine – especially since I got him his favourite Octonauts on DVD, but called “Die Oktonauten”. Incidentally, a similar bribe can work well on the iPad. We don’t use it apart from when we’re travelling, but then I have a bunch of German games that he’s happy to play and some of them are really effective for teaching him vocab. How lucky were we: when my son was about one and a half, I discovered that there was a German playgroup just a few minutes from our house and they met on a day when we were free. I joined that group and immediately met half a dozen delightful German families who are now based in Perth. Although we don’t attend the playgroup any more we still meet up with some of the families regularly and although my son doesn’t exactly chatter away with them in German – in fact many of them tend to speak English because they’re attending kindergarten or school here now and English seems to be taking over – he does at least hear them speaking to their parents in German and it reminds him that lots of people do speak German. Of course, you may not be lucky enough to have a bilingual playgroup nearby but it’s worth reaching out – my Polish friend found a Polish playgroup just around the corner as well. When my son was quite young, I took to playing German stories on CDs in the car. For a good two years he was besotted with the “Bobo” series – a simple set of stories about a little animal character – and I can honestly recite the forty-odd stories across four CDs word-for-word. Sure, they drove me a bit crazy but since he asked for them, I got more. He’s moved on to “Conni” CDs (slightly more tolerable for multiple listens) and because that’s just the habit we have, he will often ask to listen to them – especially if I dare to switch on “my” music. He wouldn’t expect or want to listen to them elsewhere but establishing a habit like that is pretty powerful – he expects to listen to German in the car and he does. A small sacrifice on my part in exchange for the benefits! All of this is, of course, not quite enough – it’s really hard to raise enough enthusiasm for him to really improve his German to the level I’d like while we are surrounded by English speakers. So I’ve devised a plan: when he reaches first grade, the plan is to take him over to Germany for half a year and put him in school there. I know that his more passive German knowledge would become super active within days and I feel like it would cement his German basics for life (with more work on it in the future of course!). Obviously this is a very big trick to pull off and there are some days I think I’m crazy to even try, but because a lot of my work is online, I’m hoping to be able to financially juggle it so it doesn’t cost us too much (and I’ve got almost two more years to get there). In my daydreams, there’ll be someone needing a house and pet sitter in a lovely small German town close to one of our relatives for just the right six months … I’m working on it! Over to you: please help me out with some more tips and tricks! I consider this the linguistic equivalent of recipes that hide vegetables … all ideas gratefully received. 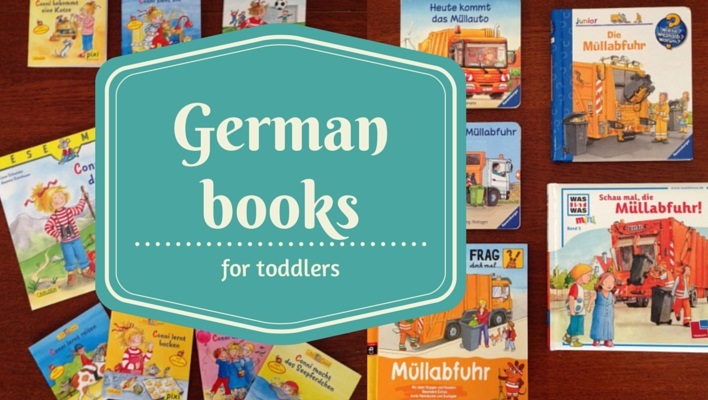 German books for babies: Our favourite children’s books auf deutsch for age zero and one German books for toddlers: Our favourite German children’s books for age two and three German books for preschoolers: Our favourite “Ich hab einen Freund …” Bücher German kids’ books: How can I teach my children German? So many great tips! I’m (obviously) a complete newbie to all of this so it’s good to start thinking about it early. I’d love my child to be bilingual and there’s no better time to learn then when they’re young. All of my Scandinavian friends say their English is so good because they watch so much American and English TV so it must be a good tactic! Thanks Monica! Yes, it’s so so easy when they’re young. I’m so jealous about how easily my son remembers new words. Now if only he could couple that with the motivation to WANT to speak his second language it would all be perfect – that’s the tough bit. We are preparing to move to Germany for 5 months while my husband is on sabbatical. Trying to learn German myself (not an easy task!) and start my 3 year old. What are ipad apps you like? I’m also interested in some CDs with German kid songs. Suggestions? In all of these the instructions are spoken in German but kids are so good at figuring stuff out by trial and error that I think that’s good. As for CDs with German songs, we have had a few favourites, especially “die Lieben Sieben” and the “die 30 Besten” series – I’ll email you some links! Thank you so much for your tips! The last one is the most efficient but it’s not the solution that the average family can actually afford (here in Russia at least). And yes, I love your Cyrillic alphabet and always like to show my son a few Russian words! I am always fascinated reading about how people raise the kids bilingually. It is very important to us to bring up bilingual kids although we are failing at the moment – it’s hard with two monolingual parents! We have enrolled our kids in a German school actually where they will speak German 90% of the time to start with. This should help us achieve this goal and hopefully give us a kick up the back side to join them. They do learn Chinese and Malaysian in preschool in Malaysia this year but it’s not immersive enough to get them to the level we would like. Anyway, I liked a metaphor they used during a talk with a linguistics professor at the German school – she said that raising your child as a bilingual is like having a set of scales where you are constantly trying to balance both languages. Basically there will always be lots of weight on the English side (in Australia anyway) so its all about putting as much weight as possible on the other side.